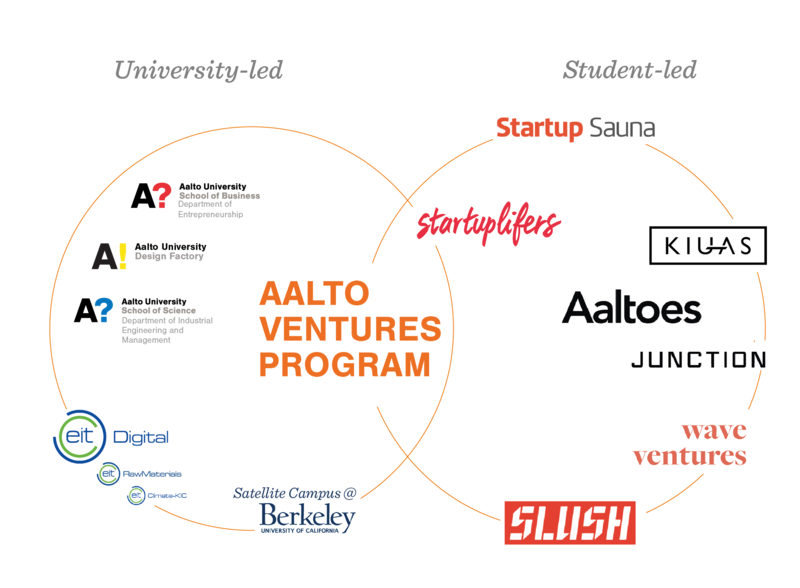 The Aalto Entrepreneurial Ecosystem was created in 2009 when ambitious students from all 3 future campuses founded the Aalto Entrepreneurship Society. The first bootcamp for university-based startups was run in the fall of 2010, and has been run twice every year. Both the facility and the bootcamp have been rebranded as Startup Sauna, which was recently awarded as the top young incubator in the World by DBIIndex. Over the period hundreds of startups have been accelerated at the Startup Sauna, and the startup internship program Startup Life and student accelerator Summer of Startups are both managed from there. One of our key partners has been Stanford Technology Ventures Program (STVP). Professors from STVP often visit Aalto and engage with students in workshops and teaching activities. We also work closely with Sutardja Center for Entrepreneurship & Technology at University of California, Berkeley, and are official parnters in Global Innovation Collider at UC Berkeley. Our collaboration with Philadelphia University and PACE University (New York) has resulted in the AVP Urban Challenge course where 17 selected Aalto got the opportunity to travel to New York and learn. 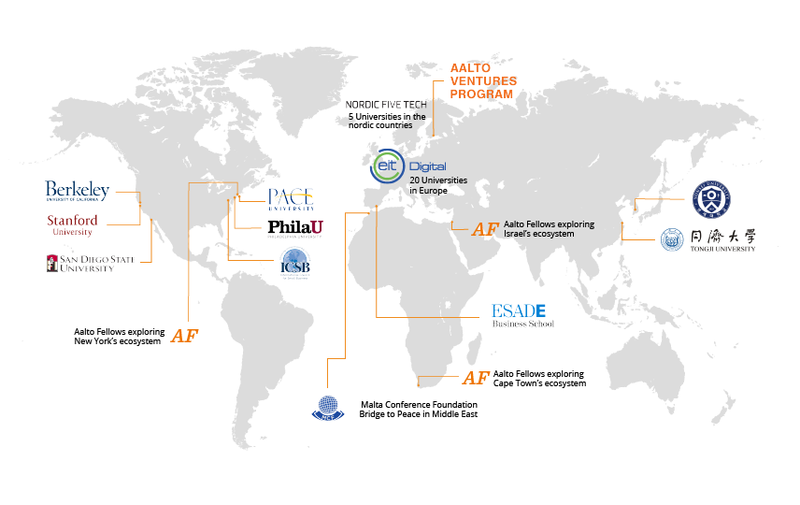 In Fall 2014, AVP took Aalto Fellows Program students to Israel to learn about high-growth entrepreneurship and booming entrepreneurship ecosystem of Israel. AVP does a lot of teaching level collaboration internationally. Together with Tongji University in Shanghai, AVP has created a joint minor on innovation and venturing. AVP represents Aalto in the entrepreneurship education activities of CLUSTER (where we have e.g. hosted CLUSTER Symposium on Entrepreneurship Education 2017), Nordic Five Tech adn International Council for Small Business ICSB (where we are hosting the ICSB World Congress 2019). We also provide entrepreneurship content for the European wide Master’s level ICT innovation program EIT Digital and teacher training to EIT Raw Materials. We are constantly working on expanding our global network to new places. If you would like to know more about AVP and our global network, please contact the service team.